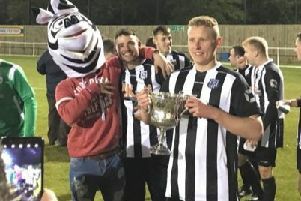 Lincolnshire League side Brigg Town Reserves have been named Sills and Betteridge Solicitors Team of the Month for December. Town picked up the award after an excellent run of form which saw them pick up maximum points in the final month of 2016. They kicked off December with a 2-1 comeback win at Ruston Sports thanks to Jack Tierney’s second-half double, and followed this with a 4-0 home win over Market Rasen Town as Tierney, Charlie Dolling and Dima Burdeynyy got on the scoresheet. The certificate and match ball was presented to skipper Christopher Rodgers by Lincolnshire League secretary Paul Birkitt before Saturday’s home match against Immingham Town. Unfortunately the accolade co-incided with the end of their good run as Brigg fell to a 2-0 defeat and stay ninth.